MRD1808-405 Dual Rack Mount 8.4″ FLIR-compatible Monochrome LCD monitor with Differential Video Input. The MRD1808 series of Rugged Rack Mount LCD Monitors are designed specifically for COTS Military Display applications. Occupying only 6 rack units of a standard EIA RS310 D – 19” equipment rack, yet having two high resolution 8.4” LCD screens with completely independent OSD controls and video inputs. The MRD1808-405 provides image reproduction that exceeds all other displays available in a similar form factor. The MRD1808-405 series of Rugged Rack Mount LCD Monitors are designed specifically for COTS Military Display applications. The MRD1808-405 occupies only 6 rack units of a standard EIA RS310 D – 19” equipment rack, yet has two high resolution 8.4” LCD screens with completely independent OSD controls and video inputs. The MRD1808-405 provides image reproduction that exceeds all other displays available in a similar form factor. The MRD1808-405 is capable of operating with legacy RGB signal timings such as RS-170 (525 Line) and RS-343 (875-Line) Interlace formats. These premium displays accept the analog monochrome RS-170 and RS-343 Video input signal format on a single BNC and feature active Video outputs provide buffered loop-through to another display device. 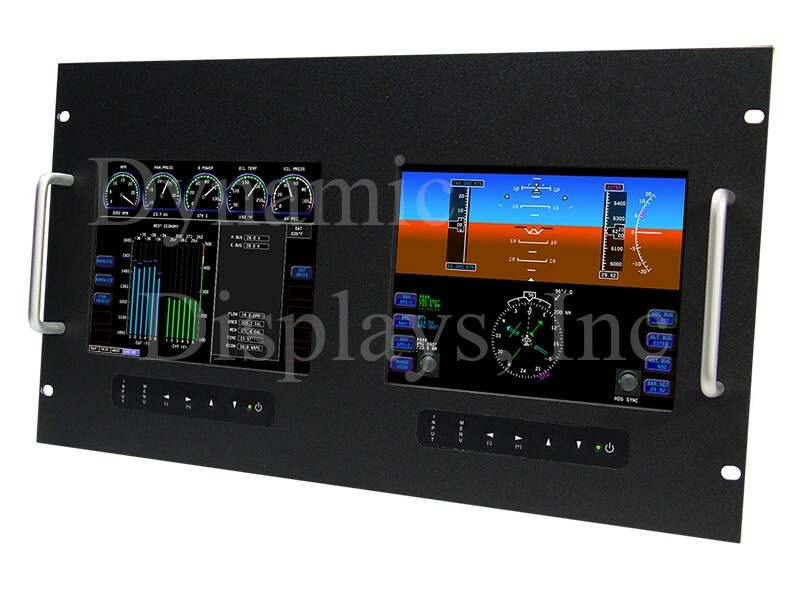 Dynamic Displays'sturdy rackmount LCD monitors are used in many military, industrial, manufacturing, and transportation applications and other uses that require bright, crisp images and versatile signal interfaces in severe environments. 8.4 In SVGA TFT LCD Display with Solid State LED Backlight. High Bright TFT Display: 600 Nits. Wide Viewing Angle: 80R/80L – 80U/60L. Analog RGB Sync On Green (SOG) -3 BNC. 15.75 to 100 KHz -Specially designed for Slow Scan Signals - Legacy Timings. Heavy Duty Cold Roll Steel Chassis. EIA RS310 D – 19” Rack Mount Standard. Custom designs including spec, color, finish, and format. Designed, Engineered and Built to comply with Military Standards. High Brightness TFT LCD Option – 1,000 Nits.